Huevos Rancheros with Hominy. 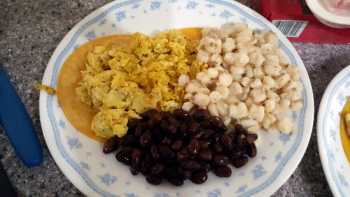 This is a very easy and very delicious huevos rancheros dish using hominy instead of potatoes. 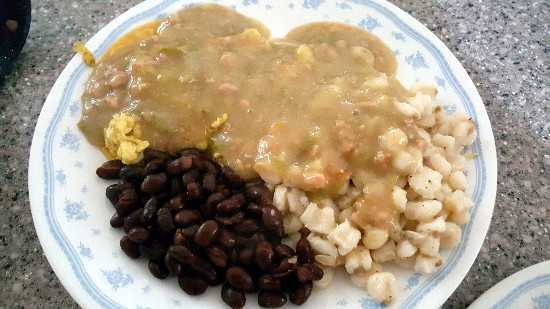 If you like hominy/posole you will LOVE this dish! This recipe is for 2, so just adjust the ingredients for additional plates. Heat your black beans, green chile sauce and hominy in seperate pans on medium heat. Heat oil in a skillet and place 2 corn tortillas at a time in your heated oil to soften your tortillas and place 2 on each plate. 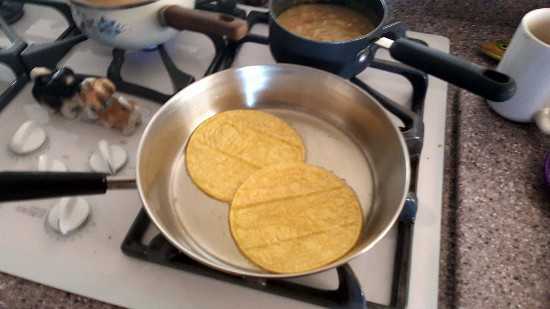 Now you should have 2 corn tortillas on each plate. Add 1/2 scrambled eggs on top of your corn tortillas, add hominy and black beans to the side of your eggs, then smother your eggs and hominy with the green chile sauce, top with cheese and serve with a heated flour tortilla (best to heat over stove). Very easy to make and very delicious!